If you're handy with a screwdriver and a saw (or even if you're not), we've got a roundup of sweet upcycled furniture you can make yourself out of old shipping pallets. Shipping pallets are plentiful and readily available - often for free - and though most businesses do their best to reuse them, many still end up in landfills. 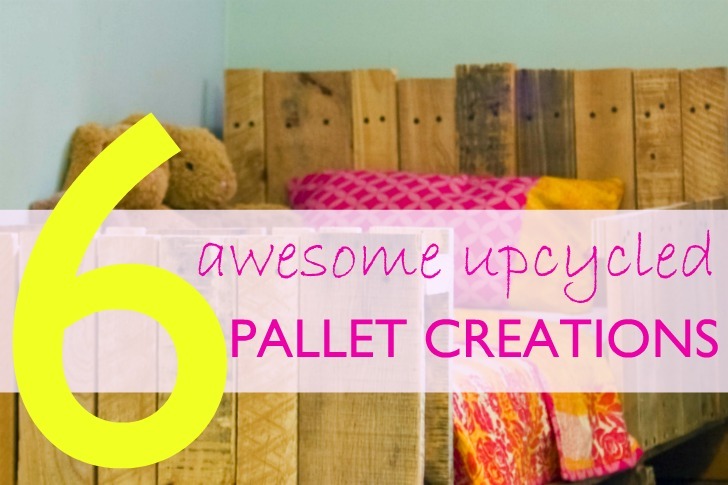 Pallets easily convert into sofas, tables and even beds, so read on for our favorite creations you can make yourself from these inexpensive materials. 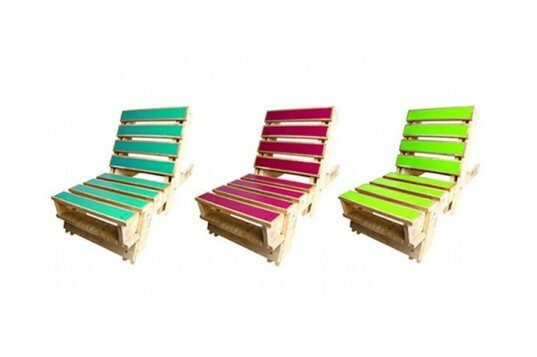 These colorful Fold-out Pallet Chairs from Gas & Air Studios are each made from a single shipping pallet. The only treatment these chairs get is a color strip, and they’re available in 14 different colors. You could easily create your own version at home too. 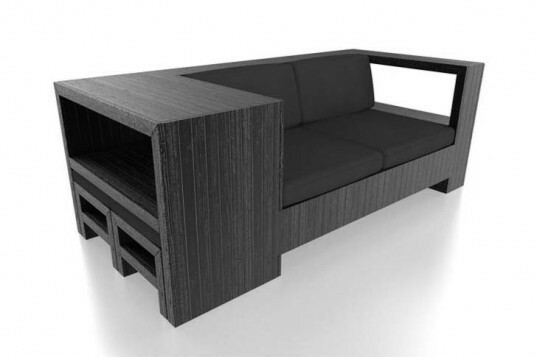 Modernist and elegant, this black sofa by France-based Studio-aparte is a multi-functional piece of furniture. It accommodates up to 2 people and has 2 handy mini-tables that tuck under the end of the sofa. 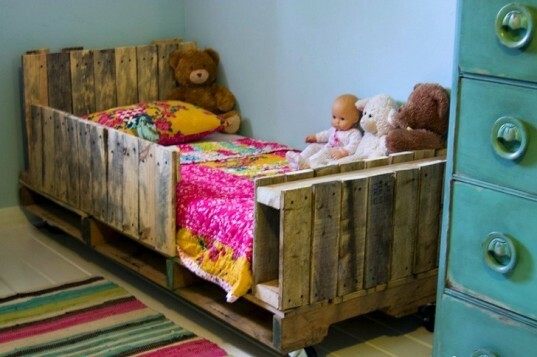 Crafty mom Lori Danelle transformed a few shipping pallets into an adorable toddler bed. Her full DIY instructions will help you create your own too. $5 worth of shipping pallets bought from my local recycling center became the coffee table of my dreams. With a little sanding and the installation of storage shelves, this coffee table is rustic a DIY project you’ll have completed in one Saturday. One of our favorite magazines put out a great issue on upcycled projects before they folded (sigh), and one of the best projects was this great recycled wood dining table. You’ll be dining in high style with this stellar upcycling project. 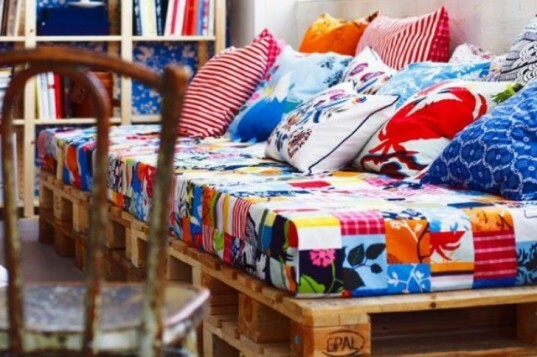 Stacked shipping pallets, a few coats of paint and some cozy cushions work together to serve as a simple couch. Pefect for the outdoors or a low-cost seating option, these DIY projects will be sure to inspire you. there are some really amazing palette projects. theres a cafe in perth w.a. Most people consider plastic to be terrible for the environment since it takes hundreds of years to biodegrade. Whats wrong with using the plastic pallets tio make the childs/youth bed they may not be totally free but can still be used the same way. I appreciate the idea pictured here and the intent to upcycle. I do however have to mention that I have read on a number of sites, including the FDA that pallets can often harbor unpleasant things like salmonella, listeria, E-colli, and others. I wouldn't put my child in a bed with the potential to have those nasties surrounding them without taking some serious precautions. Vibrant Folding Chairs From Upcycled Shipping Pallets These colorful Fold-out Pallet Chairs from Gas & Air Studios are each made from a single shipping pallet. The only treatment these pallet chairs get is a color strip, available in 14 different colors. Your own version could easily be recreated. Slick Modernist Pallet Sofa Modernist and slick, this black sofa by France-based Studio-aparte is a multi-functional piece of furniture. It accommodates up to 2 people and has 2 handy mini-tables that tuck under the end of the sofa. Adorable Pallet Toddler Bed Crafty mom Lori Danelle transformed a few shipping pallets into an adorable toddler bed. Her full DIY instructions will help you create your own too. Shipping Pallet Coffee Table $5 worth of shipping pallets bought from my local recycling center became the coffee table of my dreams. 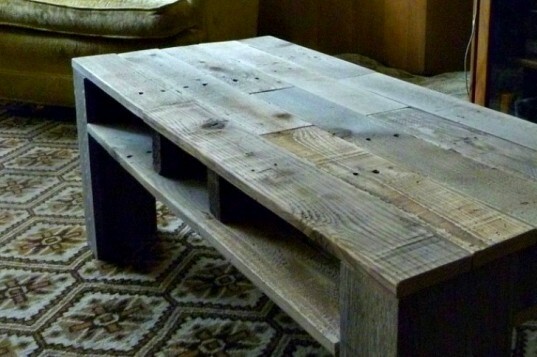 With a little sanding and storage shelves, this coffee table is rustic DIY project you'll have completed in a Saturday. ReadyMade's Recycled Wood Dining Table One of our favorite magazines put out a great issue on upcycled projects before they folded (sigh), and one of the best projects was this great recycled wood dining table. You'll be dining in high style with this stellar upcycling project. Country Sofas Made From Shipping Pallets Stacked shipping pallets, a few coats of paint and some cozy cushions work together to serve as a simple couch. Pefect for the outdoors or a low-cost seating option, these DIY projects will be sure to inspire you.